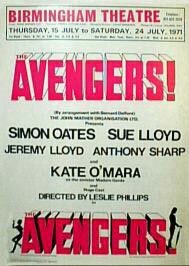 As 'lost' as the majority of the first season Avengers episodes, this play was staged in London and Birmingham only, during 1971. It ran in Birmingham from July 15 to 24 at the Birmingham Theatre, before transferring to The Prince of Wales Theatre in London's historic West End (I don't have the exact dates for the London run to hand, but there is some good material on the play in the later Rogers books and there is a review on the 1971 press page at sister site, ...deadline...). Material on the play is, as would be expected, extremely difficult to come by, but here are a few snippets - the two front of house posters (above), the programme and three photographs (links below). 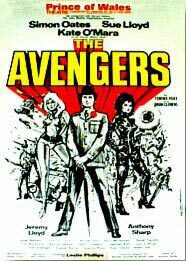 If anybody has had sight of the text of the play I'd be glad to hear from them.